This product can put the converted card with the CF card fully inserted into the notebook along with the PCMCIA card slot, not outcrop, fully integrated, and flush with the edge of the notebook! With PCMCIA interface for laptop and CFI type of card use, no driver. Transcend TS0MCF2PC PCMCIA ATA Adapter for CompactFlash Card - Silver/Black. 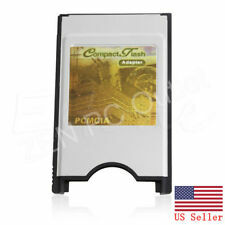 Converts 50-pin CompactFlash card to 68-pin PCMCIA. We are here to help! Fast read and write to a CompactFlash card via any PC card slot. 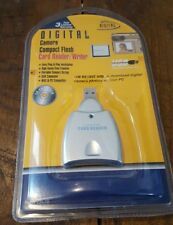 XtraDrive CF Card Reader to USB Thumb Drive. We will happily respond as soon as we can, typically within 12 hours. Great Condition. When nothing short of the best will do. You can count on Dazzle. Smile. Manufacturer: Dazzle. New Condition. Don't let this one get away. Smile. 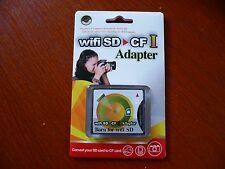 CF Card reader, New High Speed USB2.0. Rapid data transfer. Supports CompactFlashTM Type I & II. Make sure this fits. by entering your model number. CF Card reader, New High Speed USB2.0. Rapid data transfer. Supports CompactFlashTM Type I & II. Item model number: FBA_20096-01. Product Details. CF Card reader, New High Speed USB2.0. Rapid data transfer. Supports CompactFlashTM Type I & II. The standard USB 3.0 plug (type A) and micro USB plug (type B) combination, making this card reader compatible with all tablets and Android smartphones that support OTG function. The driverless plug & play solution makes for easy installation and no driver CD is needed. 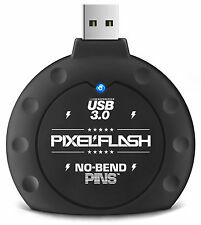 Hi-Speed USB 2.0 certified for fastest data transfer. Backwards compatible with all USB 1.1 ports. WE WILL BE HAPPY TO WORK OUT ANY PROBLEMS/ISSUES RELATING TO YOUR ORDER. About the item: This item is associated with the following MPN(s): SDDR-91-A15.